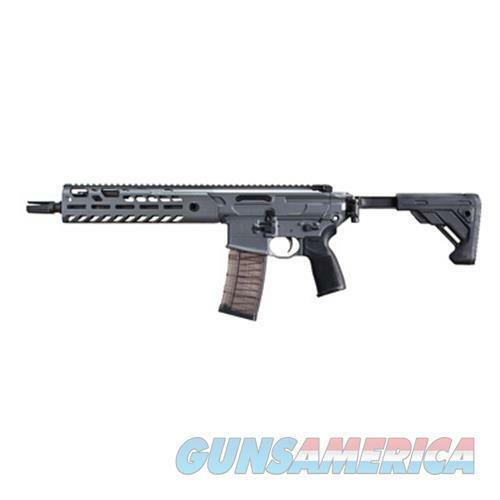 Description: SIG SAUER®MCX® VIRTUS SBR•Stealth Gray finish•Modular platform •Semi-auto Short-Stroke Gas Piston System •Internal Recoil System offers reduced recoil & a compact platform •Tapered lug design for smoother cycling & longer lasting bolt •SIG Matchlite™ Duo Trigger 4.5-6 lb. pull •Hard-coat anodized 7075 aluminum receivers •Full-length top rail •M-LOK free-floating alloy handguard with expanded valve access windows •Interchangeable nitride treated cold hammer-forged carbon steel barrel heavy contour •Threaded muzzle with 3-prong flash hider •Folding/Collapsing 5-position stock •Black polymer stippled SIG grip •Includes (1) 30-round mag •OAL: 31" (22" folded) •Wt. : 7.4 lbs.